The nation listened as Prime Minister Roosevelt Skerrit addressed the Dominican tribe in March 2018 on some matters of nation resilience-branding and post-Maria recovery considered critical for the rebuilding process. 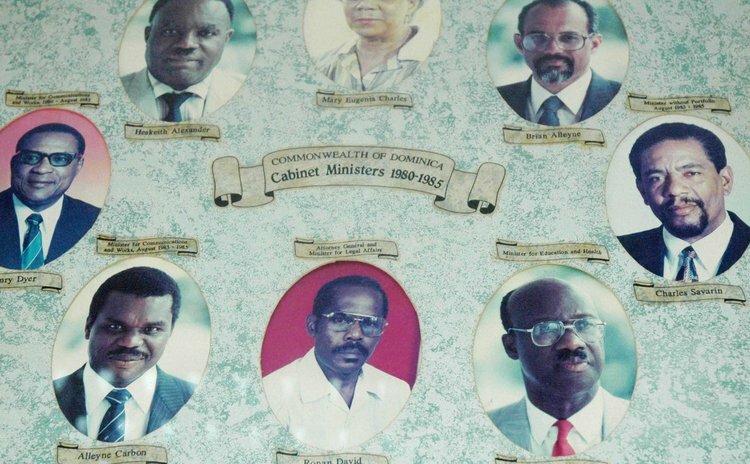 Rumours were ripe that there would be an announcement of some type of "bouyoning" of Cabinet portfolios, but most of the tribesmen were taken completely by surprise when the announcement listed Reginald Austrie as the Deputy Prime Minister of the DLP Government. There was a few seconds of hush in my mind, but that was soon replaced by aspects of the famous story titled, The Sword of Damocles. You see, the story's lesson is that tribesmen should not see their leader as only the epitome of power, intellect and contentment. That's only one half of his office. One who sits at the tip of the apex is constantly occupied with fear of being forcibly routed from the tip or, even worse, leading discontented Lieutenants who may be harbouring thoughts of mutiny or resignations. One strategy for addressing this dominant fear, as espoused by anthropologist Desmond Morris, is to empower the most likely convenor of an internal coup d'état so that he remains indebted to the leader for such empowerment. [See Morris' "Ten Golden Rules for Leaders"]. A further refinement of Morris' counsel in my view advises that the Lieutenant to be empowered should be the "duns-kyat" or "least-intellectually-endowed" on the stratus. By building an interlocking nexus with this "duns-kyat", the leader ensures that even in his absence, the "duns-kyat" poses no real threat to his leadership, because the "duns-kyat" does not have what it takes to lead. Before the "duns-kyat" leaves his desk to use the washroom, he informs the leader. For those of us with some years on our grey heads, we recall a same strategy utilised by Dame Eugenia two decades ago. Fearful that the bright men in her Cabinet, those with law degrees, would give their own brand of leadership when asked to act in her absence, she took the route of demonstrating special trust in one Alleyne Carbon, interestingly, of the Cottage Constituency. Not only did she demonstrate a positive bias in appointing Carbon to lead the government in her absence, she named him as her choice Leader of the Dominica Freedom Party when she threw in the towel. Why Carbon? The same reasons advanced for the appointment of Reginald Austrie as Deputy Prime Minister by PM Skerrit. Both men owe the crown on their heads to the soles of their feet to their Prime Ministers. They are trusted Lieutenants who when called upon by their PMs, would do anything to show their gratitude. They are both, in my view, of "little-intellectually-endowed", loud-mouthed characters and busy-bodies. They are unlikely to "bad-talk" the PMs in their absences. They won't lead a rebellion in the absence of their PMs. They call their PM on every matter before reaching a decision. They are fully cognizant that outside of politics and the Cabinet position they occupy, they are least among the tribesmen. Political commentators and students of management and leadership will refer to these two scenarios for many years to come. These are brilliant strategies on leadership and how to remain sane and in control even with Damocles' Sword suspended by a Horse Tail thread dangling over your head. The PM is happy. The new deputy is happy…and they lived happily ever after.